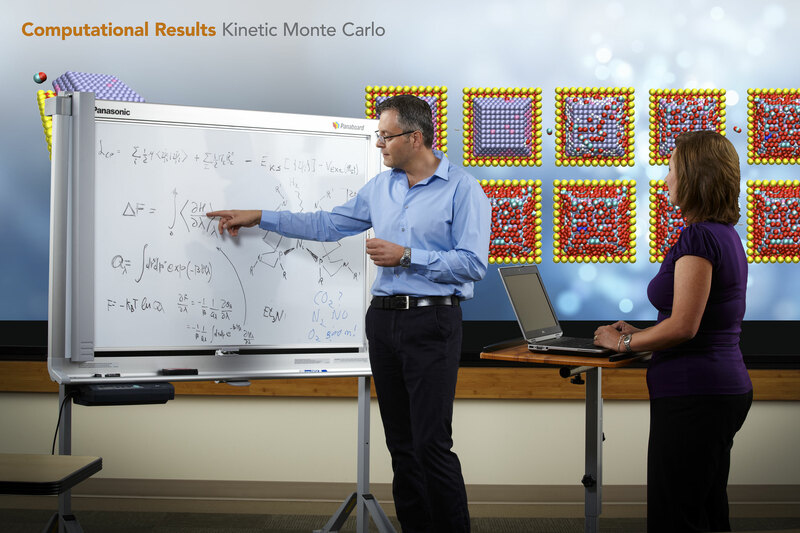 PNNL scientist Simone Raugei discusses computational studies that closely interface with experimental studies in the Center for Molecular Electrocatalysis. The Center for Molecular Electrocatalysis explores fundamental scientific principles that underpin technologies such as solar energy and fuel cells. Researcher study catalysts that can convert electrical energy into chemical bonds and back again. RICHLAND, Wash. — For the second time, the U.S. Department of Energy renewed funding for a center designed to explore fundamental scientific principles that underpin technologies such as solar energy and fuel cells. Researchers at Pacific Northwest National Laboratory, together with partners at Yale University, the University of Wisconsin, Massachusetts Institute of Technology, the University of Washington, and Purdue University, earned the renewal through significant achievements in developing catalysts that can convert energy between electrical and chemical forms. Building on their success, and expanding their team, researchers are now poised to take on new challenges. 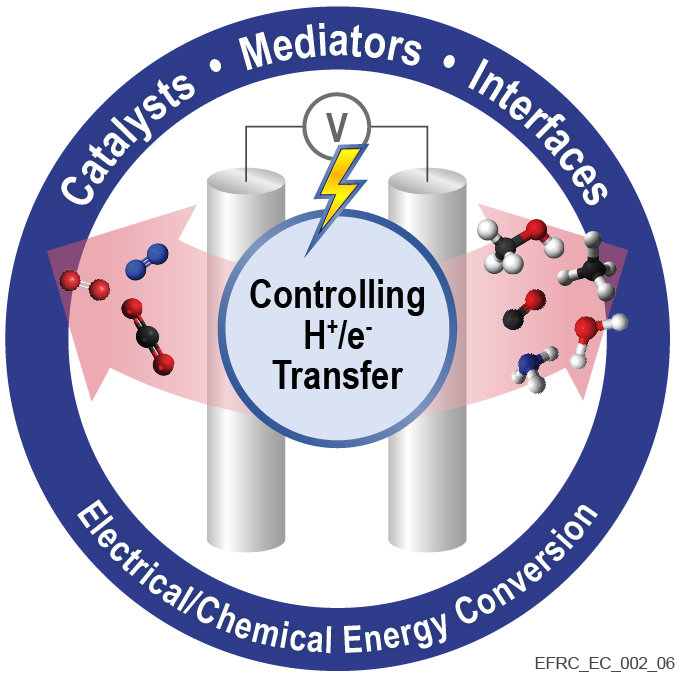 The Center for Molecular Electrocatalysis was established in 2009 as a DOE Energy Frontier Research Center. DOE recently announced awards of $100 million for 42 new or continuing EFRCs, including this one led by PNNL. The centers are charged with pursuing the scientific underpinnings of various aspects of energy production, storage and use. Since 2009, CME researchers have been studying molecules called catalysts that convert electrical energy into chemical bonds and back again. Chemical bonds can store a huge amount of energy in a small amount of physical space. Of interest are catalysts that pack energy into bonds involving hydrogen, oxygen or nitrogen. Among the reactions studied are production of hydrogen, which can be used in fuel cells, and the reduction of oxygen, the reaction that balances the oxidation reaction of fuel cells. and the most energy-efficient molecular electrocatalyst for reduction of oxygen. These fundamental scientific discoveries are important for our energy future. For example, a catalyst breaks chemical bonds to produce electricity in a fuel cell. An energy-efficient catalyst produces more power from fuel than an inefficient one — and fuel cells for vehicles need to release energy as fast as the explosions in a gasoline engine do. These efforts have sharpened scientists' understanding of the central challenges in the field and laid the foundation for the ambitious goals for future studies. Directed by PNNL chemist Morris Bullock, the Center for Molecular Electrocatalysis expects to receive $3.2 million per year for the next four years and involve researchers from several complementary disciplines. "We are excited to be able to further our scientific mission by developing new approaches to circumventing traditional relationships found between rates and energy efficiency," said Bullock. "These parameters are often correlated, such that improvements in one are obtained at the expense of the others. Typically, the faster catalysts are less energy efficient, and the more energy efficient catalysts are slower. To make breakthrough progress, we seek to remarkably improve catalyst performance through system-level design." PNNL leads another Energy Frontier Research Center, Interfacial Dynamics in Radioactive Environments and Materials (IDREAM) which is focused on solving the chemistry challenges found in tanks holding a wide array of radioactive chemical waste generated from weapons production.